Cattleya dowiana is one of the most beautiful of the cattleya species and has been a treasure for collectors since its discovery in 1850. It is the only cattleya species of the Cattleya labiata group that has yellow sepals and petals, and with its dark crimson-purple lip veined with gold, it is magnificent. 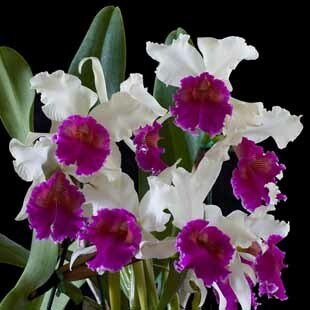 Cattleya dowiana is found naturally in Colombia and Costa Rica. This species has the only large yellow-colored flowers in the genus. Because of its beautiful color, C. dowiana has had a long history of use in breeding, and it has been used more than any other Cattleya species in creating new Cattleya hybrids. While much is known about the characteristics C. dowiana passes on to its hybrids, much remains unknown. We know, for example, that C. dowiana will intensify the color of lavender cattleyas and the vast majority of the dark-purple hybrids available today owe their intense purple color to C. dowiana. By contrast, the unique yellow color of C. dowiana’s sepals and petals is so recessive, it is rare to find it as a hybrid. But what about the striking gold veining against the dark crimson-purple background of the lip? How is this combination passed on? Is it dominant or recessive? Does C, dowiana add yellow color to the lips of its hybrids beyond the gold veining? And what does C. dowiana do to the size and shape of its hybrid? In an effort to explore these and other questions concerning C. dowiana’s influence on its hybrids, in 1982 we made a cross between C. dowiana and Laeliocattleya Princess Margaret ‘Orchidhaven’ (also known as ‘Patterson’s #2’ or just ‘#2’). We named the cross Laeliocattleya Powhatan (pronounced Pow’-ah-tan for the town in Virginia). Laeliocattleya Princess Margaret ‘Orchidhaven’ was chosen because it was a tetraploid and had a long history of producing crosses with known results. H. Patterson & Sons, Bergenfield, New Jersey, used Lc. Princess Margaret ‘Orchidhaven’ widely during the 1940s and 1950s to produce some of the most notable hybrids of the time, such as Laeliocattleya De Lores Ziegfield (x C. R. Cadwalader), Laeliocattleya American Security (x C. Royana) and Laeliocattleya Harold J. Patterson (x C. Charybdis). By using a strong proven stud with dominating genes, like Lc. Princess Margaret, we felt we could determine what some of the really dominant traits were that C. dowiana passed on to its offspring. We raised 200 seedlings to flowering size, took a slide of each flower to record its color pattern, measured length and width of sepals, petals and lip, and evaluated such characteristics as fragrance, floriferousness and openness of lip. Some results were surprising. As the plants of Lc. Powhatan began blooming, 24 of the first 100 pants were semi-albas. Their flowers had white sepals and petals with varying shades of purple lips. Gustav Mehlquist (1958) theorized that C. dowiana had the genes for semi-alba, and here was certainly proof. An occasional semi-alba has turned up in some Lc. Princess Margaret crosses (one or two semi-albas per cross), so Lc. Princess Margaret has some semi-alba genes. but the C. dowiana-Lc. Princess Margaret combination produced an overall 18.5 percent semi-albas. By contrast, Stewart’s bred Lc. Princess Margaret ‘#2’ with Cattleya warscewiczii ‘Frau Melanie Beyrodt’ and produced only one semi-alba, which is in line with a number of semi-albas found in other Lc. Princess Margaret crosses. Since C. warscewiczii ‘Frau Melanie Beyrodt’ is a semi-alba that breeds semi-albas with other semi-albas, like Cattleya mossiae ‘Reineckiana’, our results with Lc. Powhatan suggest the intriguing possibility that there may be two mechanisms for the production of semi-albas in cattleyas. C.C. Hurst (1909) showed that genetically there are two kinds of pure-white cattleyas, which he called C types and R types, that bred differently. Something similar may exist with semi-alba. Laeliocattleya Powhatan reconfirmed that the yellow color in C. dowiana’s sepals and petals is extremely recessive since only one Lc. Powhatan plant from the entire cross had yellow sepals and petals. We tried to self the yellow variety, but it produced no seed, which is not surprising, since Lc. Powhatan should be a triploid and triploids are notoriously infertile. The combination of the strong gold veining against the dark crimson-purple lip of C. dowiana appeared in only two clones of Lc. Powhatan, so the complete C. dowiana lip color may be as recessive as the yellow color in the sepals and petals. The two traits (crimson-purple lip and yellow-gold veining), however, appear to be inherited independently of each other since only 6 percent of the Lc. Powhatans had lips with deep crimson-purple color while 21 percent had significant yellow-gold veining in the lip. The extremely dark crimson-purple color of the C. dowiana lip itself appears to be tied to the white sepal-petal pattern because it only occurred in semi-alba varieties. No variety with lavender sepals and petals had this intense dark lip. More than two-thirds of the Lc. Powhatans had a variety of yellow color tones and patterns in their lips that varied from bright yellow eyes, like ‘Steven Christoffersen’, to yellow veining like ‘Royal Glow’, to mostly yellow like ‘#131’. We assume the yellow color came from C. dowiana because Lc. Princess Margaret has cream-colored eyes with no real yellow in the flower, and Lc. princess Margaret is not noted for producing yellow color in the lips of its hybrids. R.E. Post (1965) states that the Costa Rican C. dowiana, which often has some lavender in its yellow sepals and petals, produces “vivid dark purples” in its hybrids, while the Colombian C. dowiana aurea, which has clear yellow sepals and petals with no lavender, “does little to darken these same blooms.” Our results with Lc. Powhatan, however, show clearly that the Colombian C. dowiana aurea also increases the intensity of purple color in its hybrids because one in five plants of Lc. Powhatan had a significant increase in the darkness of the purple color over Lc. Princess Margaret. Laeliocattleya Powhatan ‘Meadowlark’, for example, has a dark, suffused purple color that is typical of Cattleya Fabia and other C. dowiana-derived hybrids. Cattleya dowiana aurea ‘Meadowlark’ (the C. dowiana used to make Lc. Powhatan), is our second-generation inbred variety selected for, among other things, its clear yellow-colored sepals and petals that lack lavender pigment. Laeliocattleya Princess Margaret does not have a C. dowiana-like fragrance, but 80 percent of all Lc. Powhatans do have a strong C. dowiana fragrance, so fragrance must be considered a dominant trait of C. dowiana. Laeliocattleya Princess Margaret hybrids normally have two or three flowers per stem like Lc. Princess Margaret. However, Lc. Powhatan has three or four flowers like C. dowiana, so C. dowiana seems to increase floriferousness. Measurements of the width of the petals of Lc. Powhatans suggest that C. dowiana reduces petal width. The majority of the Lc. Powhatans had petal widths midway between the parents. Lips segregated into three groups: 31 percent had wide lips like Lc. Princess Margaret. 31 percent had narrow lips like C. dowiana and 38 percent had widths midway between the parents. Both parents have open lips that expose the column, so C. dowiana’s effect on this characteristic could not be determined. Ten percent of the Lc. Powatans, however, had closed lips where the column is not exposed, which is probably a contribution from Lc. Princess Margaret’s background. Although there is still much to be learned about C. dowiana, we believe Lc. Powhatan has made a significant contribution to understanding the genetics of this fascinating flower. Laeliocattleya Powhatan has established that C. dowiana has genes for semi-alba, and has raised the question of whether these genes are different from the semi-alba genes of other Cattleya species like C. warscewiczii. Laeliocattleya Powhatan has shown that the full C. dowiana lip pattern itself is highly recessive, but that C. dowiana significantly increases the amount of yellow tones, including gold veining, in the lips of its hybrids. Finally, this hybrid has demonstrated that the clear yellow-petaled Colombian C. dowiana aurea can intensify the dark purple color of its hybrids just as the lavender-yellow Costa Rican C. dowiana does. Cattleya dowiana is often considered difficult to grow in cultivation when, in fact, it is a vigorous, free-flowering, easy-to-grow plant if a few basic rules are followed. The most important rule is to grow C.dowiana so its roots dry quickly and are never subjected to a wet, soggy medium. For this reason, C. dowiana is either grown in clay pots that barely accommodate the plant and one new growth, or it is planted in hanging baskets. Cattleya dowiana also likes to be kept dry when it is not actively growing and the easiest way to retard its growth or kill it is to overwater it during the cool winter months when it is dormant. In its native habitat, C. dowiana grows at the tops of tall trees in the jungle where its roots dry out rapidly after a rain. It also has a dry resting period in the jungle in December and January. Ignoring C. dowiana’s need to dry out will cause the roots to rot and eventually the pseudobulbs will decay. Unlike black rot of cattleyas, which begins on the youngest, softest growths, C. dowiana pseudobulb rot begins at the base of the oldest pseudobulb and progresses through the rhizome and kills the youngest pseudobulb last. Pseudobulb rot is always fatal, and it is the main reason virtually all of the fine old clones of C. dowiana from the turn of the century are no longer in existence. Cattleya dowiana requires lots of sun and, if you want to enjoy its spectacular four-to-five-flowered spikes, you must provide this. Plenty of moving air from fans is beneficial, too. This helps keep its leaves cool and aids in drying its roots. In the Northern Hemisphere, C. dowiana begins growing in early spring, flowers in mid- to late summer and, after flowering, goes dormant until the following spring. It requires frequent watering when it is actively growing, but little water after flowering until it begins growing in the spring. Fertilizer is not an essential ingredient to growing C. dowiana well. If you grow in bark mixtures, a light fertilizing during the active growing season is needed. Apply ¼ teaspoonful of a soluble 20-20-20 per gallon of water every two weeks until buds appear in the sheath. After that, do no apply any fertilizer until the plant begins growing again in the spring. Never use a slow-release fertilizer because this may continue to feed during dormancy, which can contribute to pseudobulb rot. Several orchid companies have been selling seedlings of C. dowiana in recent years, so plants should be available for anyone who wants to grow this delightful species. In addition to its beautiful color, C. dowiana has a hauntingly lovely fragrance that can fill your whole house and greenhouse, and will certainly fill your soul. — A.A. Chadwick.